Last night was the opening of the redesigned interior of SPACE10 - the Research and Design Lab in the Meat Market district of the city. They now have a new street-level gallery space and café area - a Test Kitchen that has been developed with Depanneur - and office space on the first floor has been rearranged so the work areas can be reconfigured for an increase from 10 to 30 people now working here. Spacon & X have designed the area "not to last but to adapt" with a strong steel framework with panels that can be inserted as required, in part to reduce noise, for work pods. With this project, SPACE10 and Spacon & X have reassessed how people work in flexible common space with the aim to boost "innovation, wellbeing and morale." A small exhibition - described as a pop-up exhibition - has just opened at Designmuseum Danmark. With the subtitle The Missing Link in Danish Typography History, it spotlights the new font called Flexibility that was introduced last year as part of an updating of the typography and graphics used for the museum and is to be used across all aspects of their graphic design from posters to signage and display graphics, as the font for the museum's website and for in-house leaflets for publicity. This work was undertaken by the Copenhagen studio Urgent. Agency. As part of the commission they searched through the archives of the museum and found initial sketches for this font that dated from the beginning of the 1960s and were by Naur Klint - the architect and designer who was the son of Kaare Klint. The designs were digitized and this was the starting point to produce a font appropriate for the museum. With the exhibition there is a handout newspaper that sets out a good brief history of the design museum and also sets out the iterations of the typeface with various weights and an italic and an outline version. This was another brilliant example of ingenuity on show at the market at Frue Plads. Signe Bailey is a designer who works with ceramics and at the Frue Plads market she showed her tableware, ceramic jewellery and distinctive and very unusual designs including the Platters … a number of spines or spindles in fired clay held in holes in a flexible collar so the angles and spaces adapt to fruit placed on or within the spines. But I was most taken by the Vue lamp because it illustrates all that is best about good design. There are lots of pendant lamps on the market …. most in glass or in metal or plastic and some even in wood or basketwork. The Vue lamp is in thin, self-coloured stoneware and the lamp demonstrates all the best qualities of the material including the fact that it is matt making it seem less intrusive and warmer and much more friendly. It might seem counterintuitive but a hard material like fired clay can look soft. Obviously it is not transparent - like glass - but here that is seen as an advantage for the primary function of this lamp is as a downlighter when it is set over a table or work surface or it can be hung lower over a side table or close to a chair as a reading lamp. 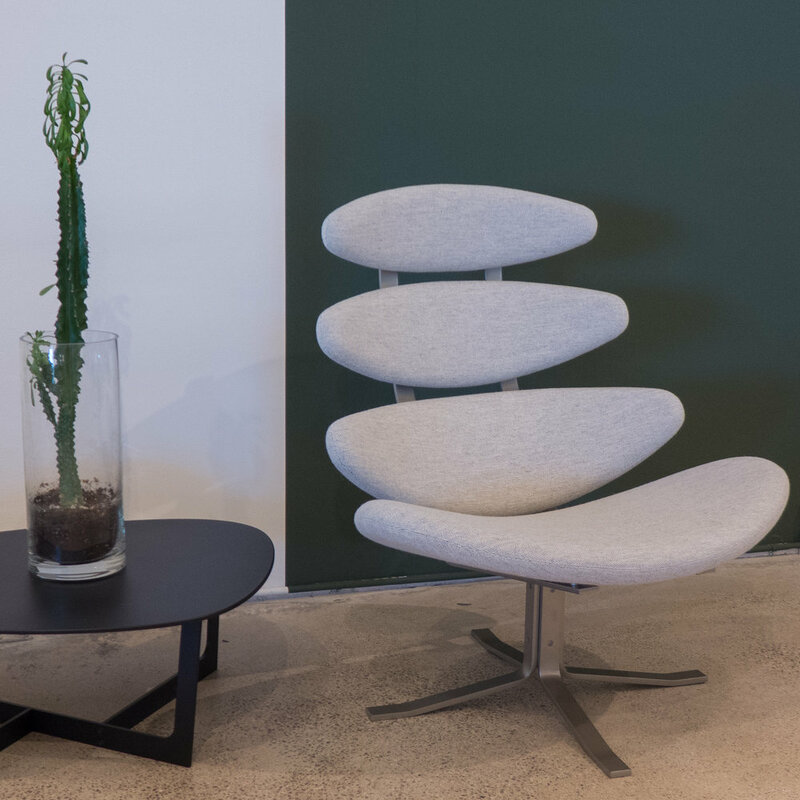 The shape is deceptively simple and beautifully elegant … in terms of geometry a cone but with gently-curved convex sides; with an open base but cut off at an angle across the top. But the really clever part is a simple slot that is cut running out from the centre of the top to the highest point of the truncated cone and then half way down the side and this takes the flex for the bulb holder inside the lamp. A retaining ring inside keeps the lamp in position at whichever point it passes through the slot. This means that the lamp can be adjusted - spun along line of the slot - to any position from pointing straight outwards horizontally and through any angle to pointing vertically straight down. Signe Bailey has her own company - Clayform - but she was also a founding member of Den Danske Keramikfabrik - the ceramic factory on Bornholm - established recently by a co-operative of ceramicists to make available flexible production - in terms of the range of technical production methods and the ability to produce larger quantities - that are not always available to an independent ceramicist working in a small studio. 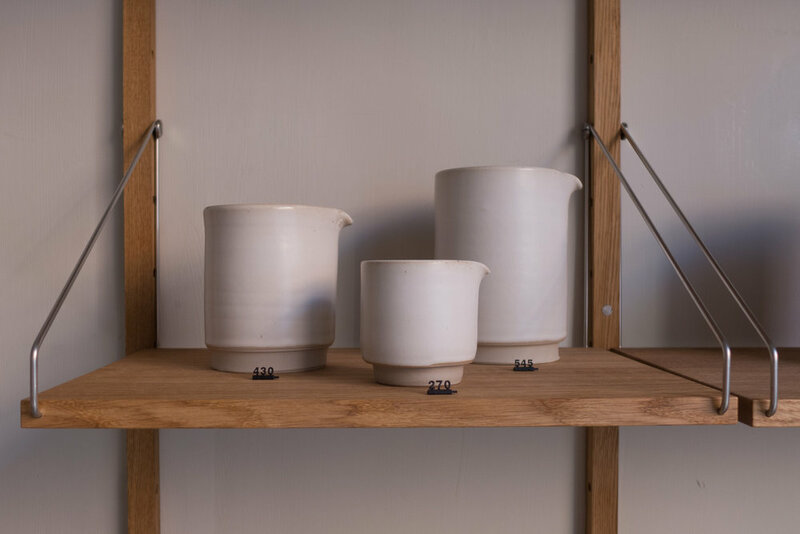 The lamp is produced in a soft grey or off white but the close link between the designer and the ceramic factory means that lamps in other colours can be commissioned. The design could hardly be more minimal or hardly more sophisticated and that is an important point that has to be made. The very best of minimalist design is not simple. A designer cannot go straight to simple without going through an incredible and often lengthy process of trial and adaptation and adjustment to take an idea and realise it in terms of what might actually be a complicated or variable function with a form and style that is appropriate to the material and its qualities and then reduce that design to what is essential or rather to take it back to the essence of the idea. A minimalist design of this quality is not simple or quick or easy. On a very busy afternoon at the market Signe very kindly demonstrated how the Vue lamp can be set at different angles and let me film her. Many thanks for your patience. The Clayform Facebook page has a good video that shows the Vue lamp being made in the factory. The textile designer Helene Vonsild was at the market on Frue Plads with a wide selection of the designs that she markets through her company 1+1Design. As well as commercial designs for textiles she uses fabrics she designed for Kvadrat to produce a range of cushions and bags. 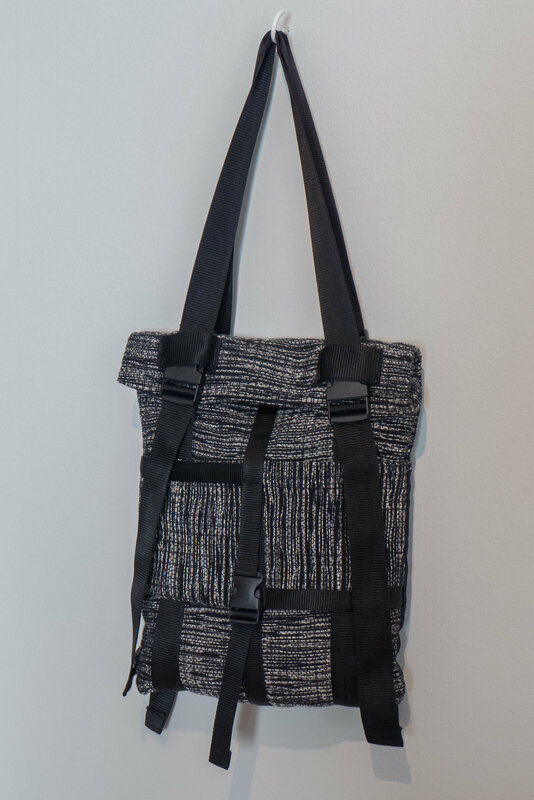 A shoulder bag with an adjustable strap in dark grey rubber was interesting because it illustrates well an important aspect of good design that is not discussed enough. The straps for the bag, with a series of slots and with notches along each edge, is an industrial product used for tree ties … a robust strap to hold a young sapling against a supporting stake … so strong to prevent the tree moving and snapping in wind but soft so it does not rub the bark of the tree with any movement and adjustable so it can be moved outwards as the tree grows or as a new and thicker stake becomes necessary. Fixed to the bag with the right size and the right colour of button it could hardly be better for an easily-adjusted shoulder strap. This is a designer using ingenuity ... seeing an existing product in a new way for new uses or identifying a problem and finding the best way to come up with a solution. Until recently, &Tradition had their showrooms and studio on Paper Island, right in the centre of the city, but those former warehouses, where the newspaper industry had stored paper for printing - so hence the name - are being demolished to make way for a major redevelopment of apartments and a new inner-city swimming pool. So &Tradition have moved across the city and are now established in a fine 18th-century town house that overlooks the King's Garden. The change could hardly be more dramatic. Visiting the new showrooms and new studio and offices of the design company for the first time was one of the most interesting revelations of 3daysofdesign … or rather one of the most amazing and, to be honest, one of the most appropriate and clever transformations for a design company I have seen. Don't get me wrong …. the old showroom, designed by the Copenhagen architects Norm, was dramatic with impressive space but the collection always looked slightly lost and, to be honest, it was difficult to make that step to imagining how that furniture might look in the sort of spaces we actually occupy. Furniture and lighting from &Tradition has been the usual mix of most Danish design companies ... so good classic designs - like the Mayor Sofa designed by Arne Jacobsen and Flemming Larsen in 1939 or the Flower Pot light by Verner Panton from 1969 - alongside new furniture commissioned from designers like Jaime Hayon. With the move of location comes a new tag line … &Tradition Home of a Collector. 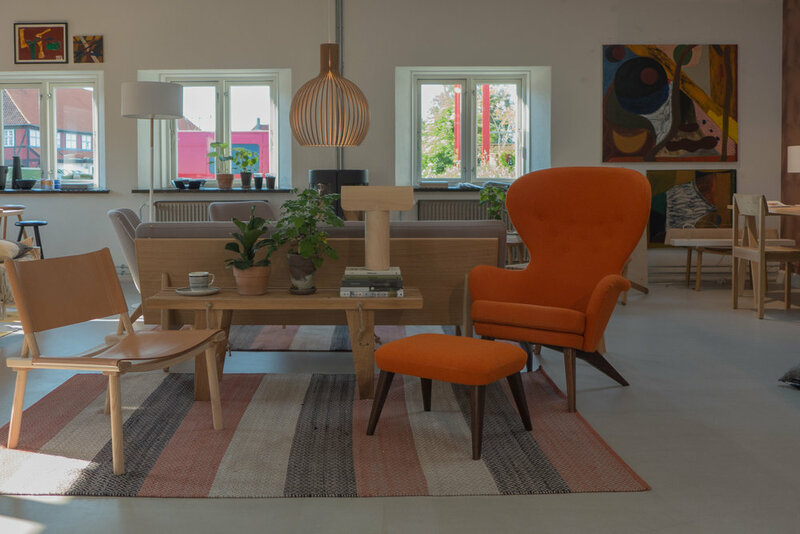 It takes the furniture up a notch or three to break away from the crowded middle ground of Danish design companies and puts the furniture into a clearly domestic but very comfortable setting. This is Copenhagen interiors at their most stylish. The house has a very grand entrance from the archway from the street but beyond is an incredibly pleasant courtyard and there is a new café. If there were clear new trends from 3daysofdesign this year it was the use of named and well-known independent stylists - rather than in-house designers - and a growing number of design stores that have a café. This is furniture buying as a destination trip. And no ... that's not snide sarcasm … I only get round these events with in-flight refuelling of caffeine. It is not all room settings here, for there are good displays of lighting and a couple of exhibition areas with a good small show about the background to the Little Petra Chair that was designed by Viggo Boesen in 1938 - after a trip to New York - and this chair is the latest addition to the &Tradition collection. 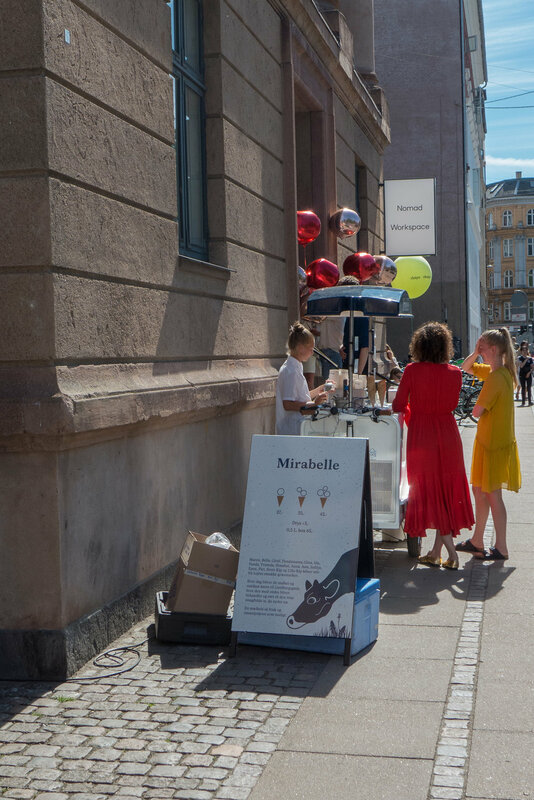 FRAMA studio and store in St. Pauls Apotek in Fredericiagade was open on the first evening of 3daysofdesign with people moving out onto the pavement to enjoy the warm weather. This was an opportunity to show new additions to the collection - so a selection of cutlery in the ICHI range from Ole Palsby, now sold in the store, and a new tie in with home goods from the Japanese brand Ouur. 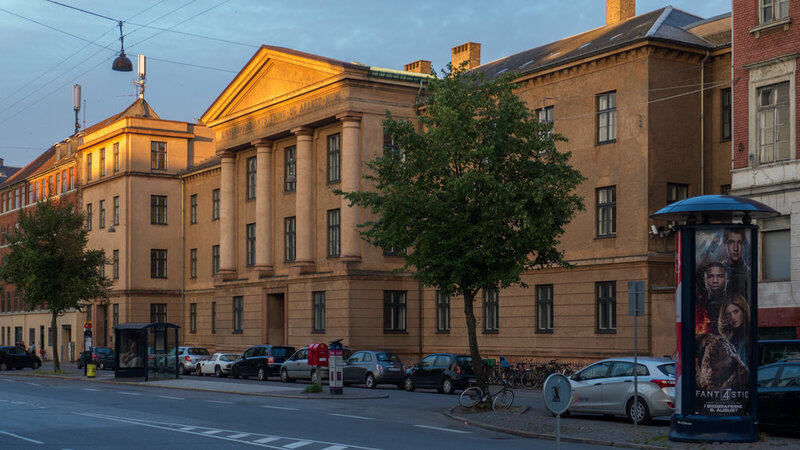 This amazing building on Blegdamsvej was the front range of a prison that was designed by the Danish architect Michael Gottlieb Bindesbøll and built in the middle of the 19th century. It faces across to Sankt Johannes Kirke and the square of Sankt Hans Torv. 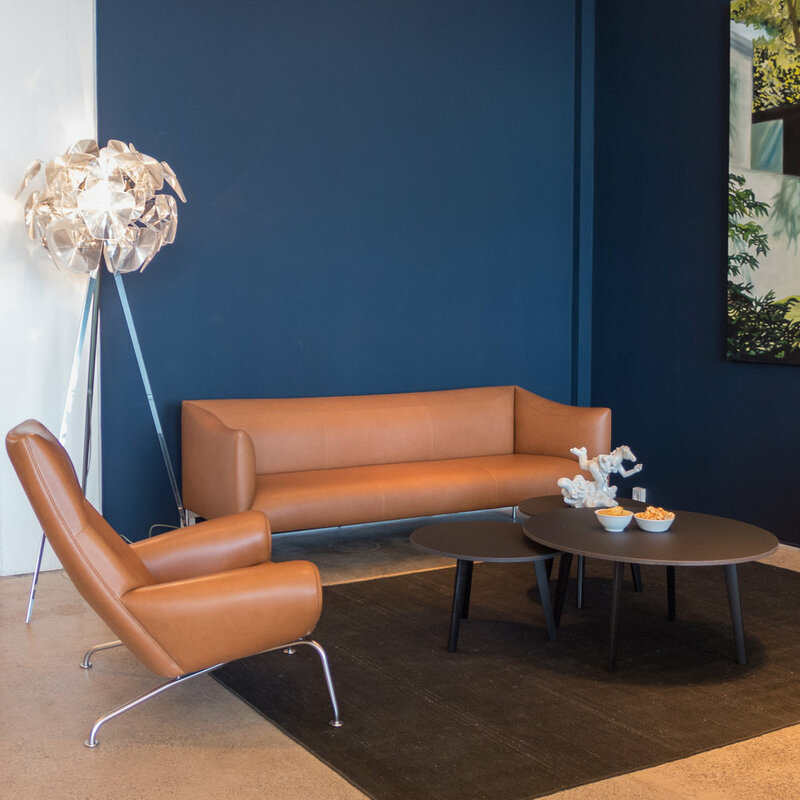 A recent and extensive restoration of the building now provides space for small offices, studios, workspaces and meeting rooms that are rented by designers, studios and design companies. Apparently, office facilities such as printing and, most important, coffee are included and there is a very trendy café so this seems to be a good first home for young companies. It is certainly a dramatic space with an impressive staircase immediately beyond the entrance and a whole sequence of meeting rooms through the basement. 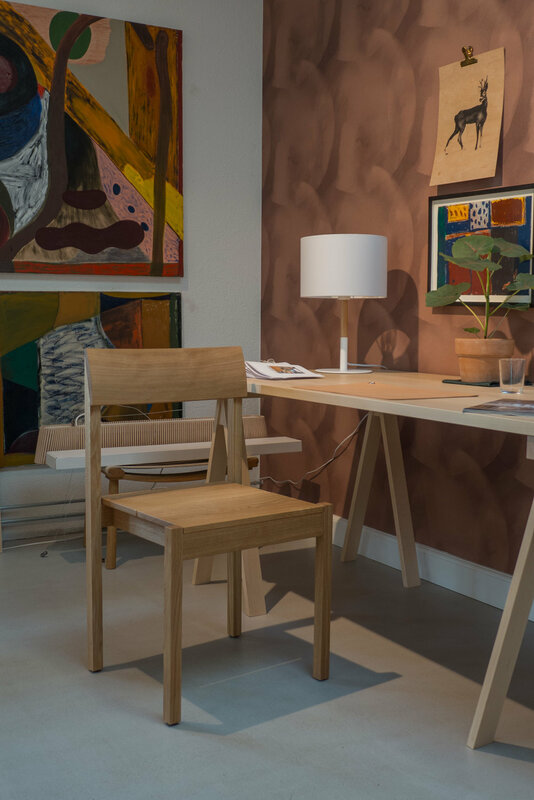 Furniture shown here included chairs by Isabel Ahm; the marbled painted tables by Pernille Snedker Hansen from Snedker Studio and the Cocoon Icon chair by Kevin Hviid and Martin Kechayas. Muuto chose the building for their major show for 3daysofdesign and working with the interior designer Natalia Sanchéz of Spatial Code they furnished the main rooms across the front of the building. 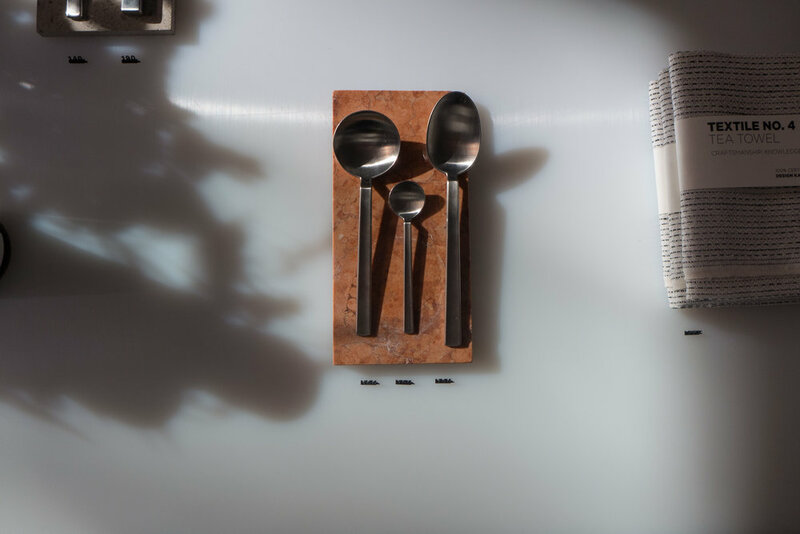 Muuto also produced 'site specific' installations by artists using Muuto products so, for instance, wall decorations that used the Muuto wooden dots. On a very hot day there was an ice-cream vendor at the steps and I had to smile as the young and trendy and the not so young but trendy of Copenhagen seemed to be much more focused on the amazing food and huge range of beers laid on rather than being there for the design. This is a good area for such a venture … in the streets north beyond the square and in the streets behind Nomad, running back towards the lakes, there are new independent galleries, small design studios and a good mix of cafes with a good number of antique and second-hand shops and, of course, the brewery … Nørrebro Bryghus on Ryesgade. What more could a 30 year old want on a Saturday? I've only been in Copenhagen for four years but I have worked out that the place that sums up all that is best about 3daysofdesign is to be at Frederiksgade 1 on the first evening of the event. The building is a large and ornate apartment building dating from around 1900 that forms part of the framing of the approach to the Marble Church from Store Kongensgade. The key occupant and linchpin is Getama - a company that itself dates back to 1899 when they first made mattresses or, to be more specific, they "specialised in seaweed mattresses." They now manufacture many of the best known designs from the classic period but also have a less-obvious commercial side … less obvious that is to the general shopper who may not automatically call the name to mind but, if they are Danish, will, almost-certainly, have sat on a Getama product as Getama are a major producer of high quality theatre and conference seating. 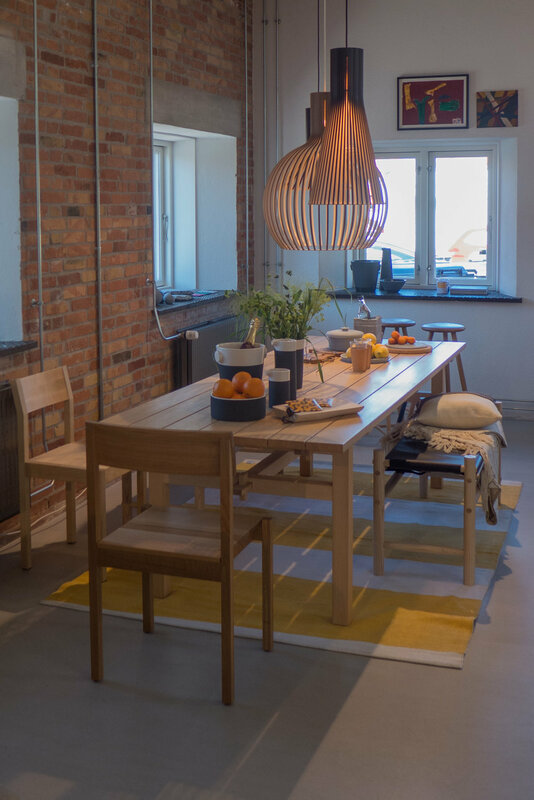 Getama have the third floor of the Frederiksgade building with a warren of rooms around a central light well. Climbing up the staircase, the former apartments are now offices and showrooms and studios for a whole community of designers and design companies and here the key word is community. This is the place where you really feel that at the core of Danish design is not this weird current idea of a Danish design DNA but rather more straightforward ideas like huge commitment, real talent, drive and determination but, overall, a real and obvious passion and enthusiasm for design. 3daysofdesign is when they open the doors to friends and families and colleagues working all over the city. Here for three days it stops being about spread sheets and what comes across absolutely is that great design is life enhancing and to be shared. It was really difficult to take photos that evening simply because there were so many people. The large apartment building at Frederiksgade 1 is close to the Marble Church and has been hemmed in by engineering works for the new metro station so for several years the front entrance has been reduced to a sort of narrow alley fenced across by high dark-green hoardings and has had a ‘temporary’ wooden ramp over the front stone steps. But this building is home to an amazing group of design companies. In fact it connects through to the furniture store nyt i bo that is sort of across the courtyard at Store Kongensgade 88 … sort of because at upper levels all the apartment spaces, all round the courtyard and above nyt i bo, are occupied by design companies. For design in Copenhagen it is - to use a word I hate using - a hub. 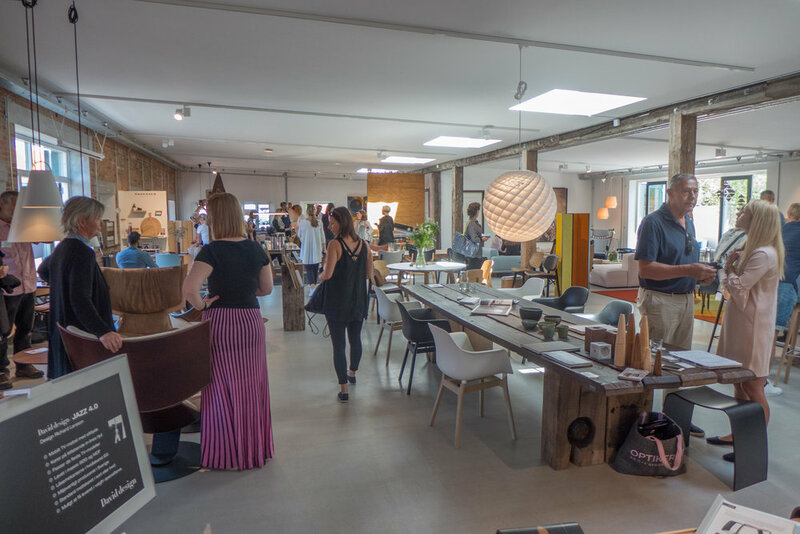 Here there are offices or studios or display space for House of Finn Juhl, File Under Pop, Helle Flou, Overgaard & Dyrman, PLEASE WAIT to be SEATED, Vibeke Fonnesberg Schmidt and others … and, of course, across the top of the whole thing, Getama. 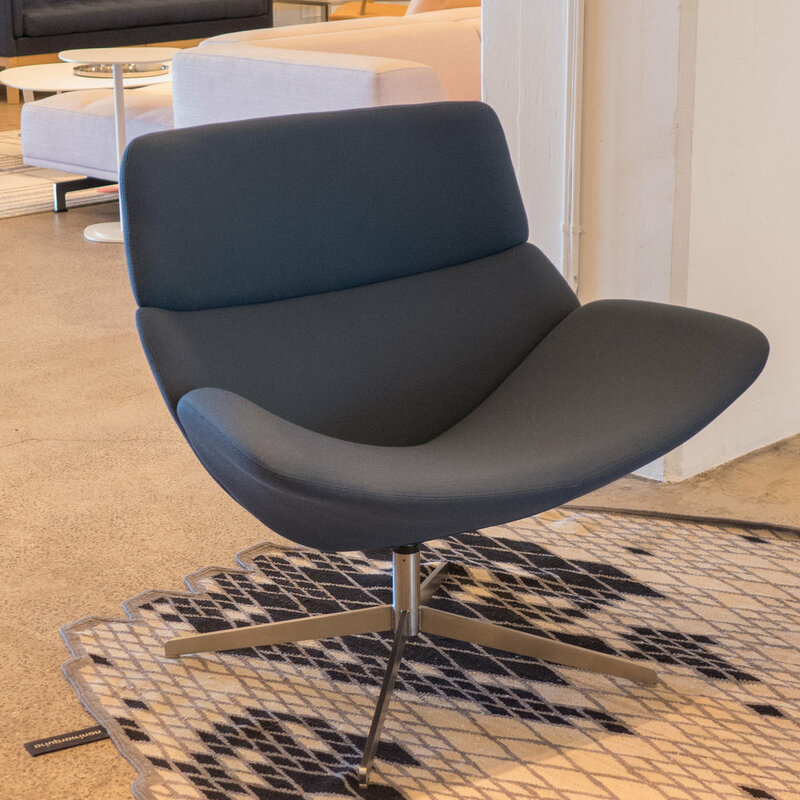 For 3daysofdesign nyt i bo hosted a number of pop-up displays and demonstrations by companies including dk3 and Sika-Design. One of the entries in the programme for 3daysofdesign describe the place as a “creative society” and packed out with visitors on the first evening I guess that is a much better description of the place than as a hub. Weaving Kiosk had set up a loom at Frederiksgade and showed some of the work they produce. Rosa Tolnov Claussen and the Finnish fashion designer Merja Henele Ulvinen work together to run a series of weaving classes that introduce the craft skill to people who have not woven textiles before and they have designed pieces, like a backpack/bag, that students taking the classes can produce and take away with them … both the bags shown here were on loan from the new weavers who made them. This is not about a nice hobby for weekends - though it could certainly be that - but neither is it about some sort of extreme political angst about people taking back the means of production. 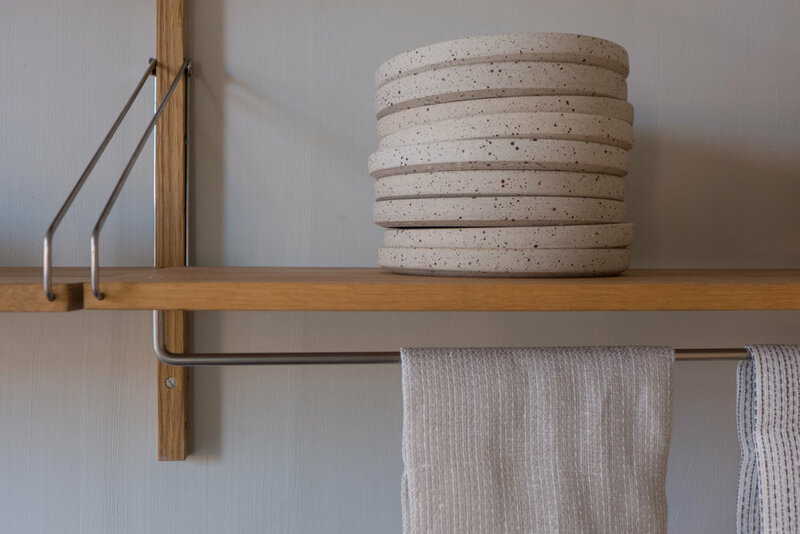 But it seems to me that important initiatives like this are about making people aware of a strong tradition of making by hand the objects we need and use everyday. And by making design less about consumerism or passive search and buy - unless you define activity as swiping a finger across the screen of a phone or iPad - and certainly more about understanding materials and appreciating how things we use are made and understanding how it is possible to find good design that we like and good design that should - even if it is in a simple way - enhance our lives every time we use what we have. And it seems to me that having makers, craftsmen and designers, working in the community rather than out on an industrial estate or in an open-air museum - should inspire us and inspire our kids to be fascinated by designing and making and producing so they understand much more about what they are buying. If children don’t see a work bench, how do they know they could one day be a cabinet maker and if they don’t see a potter at a wheel how do they understand how, by stages through our history, people have found ways to make wet clay into useful or beautiful pots or pots that are actually both useful and beautiful. Without handling yarn and making textiles how do we understand the different characteristics of linen or cotton or wool and how can we really appreciate the different textiles we buy? 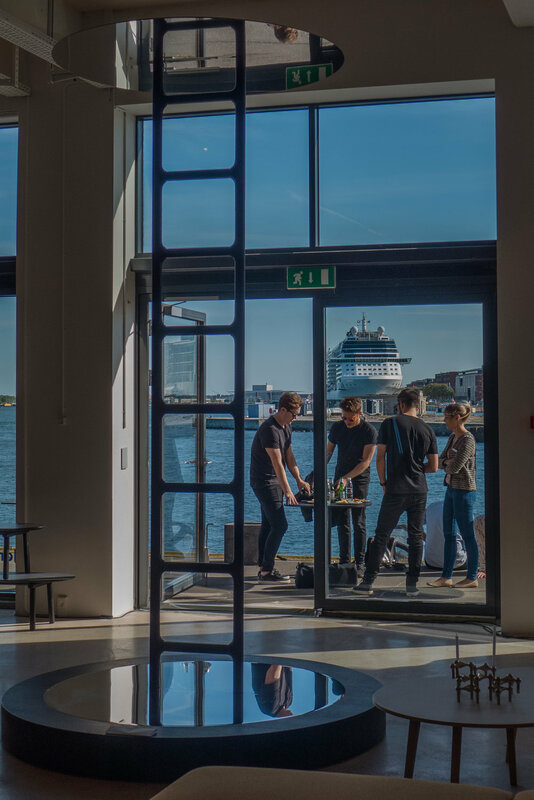 Erik Jørgensen Møbelfabrik have offices and display space out at Pakhus 48 in Nordhavn where they are in one of the huge former warehouses along with Vola, the tap and bathroom fittings company, and with Kvadrat, the Danish textile company. Joint events here on the first evening of the three days are a very popular high point. Not only is this a good opportunity to see the furniture from Jørgensen in the generous space and in the natural light of the warehouse but for 3daysofdesign - they had rebuilt Portal ..... an installation designed for the Milan furniture fair in the Spring by the Norwegian architects Snøhetta, working with Jørgensen. 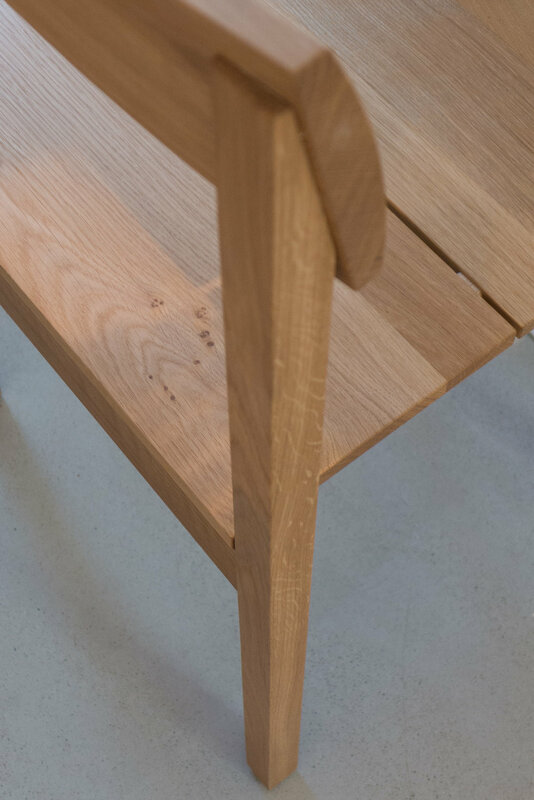 An oak ladder covered in leather appears to be standing free between two round mirrors to create an infinite sequence of images but this is not simply a visual game because it also demonstrates the craftsmanship of fine leatherwork from Jørgensen. Pakhus 48 has large windows that look south down the harbour so the space has bright natural light - particularly in the afternoon - with strong shadows and very strong patches of light across the floor and with light reflected up that comes up off the water so it can be dramatic anyway, even without mirrors and with a lot of people around for the opening and a fair bit of wine the whole thing was a bit disconcerting.